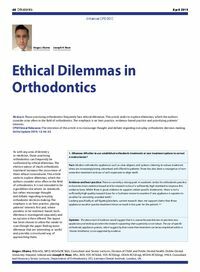 Abstract: Those practising orthodontics frequently face ethical dilemmas. This article seeks to explore dilemmas, which the authors consider arise often in the field of orthodontics. The emphasis is on best practice, evidence-based practice and prioritizing patients’ interests. Clinical relevance: Those practising orthodontics frequently face ethical dilemmas. This article seeks to explore dilemmas, which the authors consider arise often in the field of orthodontics. The emphasis is on best practice, evidence-based practice and prioritizing patients’ interests. Author notes: Angus J Burns, BDentSc, MFD, MOrth(RCSEd), Consultant and Senior Lecturer, Division of Child and Public Dental Health, Dublin Dental University Hospital, Ireland and Joseph H Noar, MSc, BDS, FDS RCS(Ed), FDS RCS(Eng), DOrth RCS(Eng), MOrth RCS(Eng), FHEA, Consultant and Honorary Senior Lecturer, Department of Orthodontics, UCL Eastman Dental Institute, London, UK. Objective: To highlight ethical dilemmas which arise in everyday practice in orthodontics to encourage thought and debate around the decision-making process.